Celtic manager Brendan Rodgers has ruled out a loan move for Michael Johnston "at this point in time". Reports suggested fellow Premiership sides Hibernian and St Mirren were hopeful of acquiring the 19-year-old. Rodgers has not dismissed a future loan move, but wants to take a closer look at the winger, who played and scored in Saturday's 4-1 friendly victory over Standard Liege. "At this moment in time he's very much in my plans," said Rodgers. "He's a very exciting young talent, 19 years of age. His best position is off the left-hand side, but the other day in the game [against Standard Liege] he played off the right, he was very comfortable. "He's learning the other side of the game in terms of that tactical idea of pressing, and how to work and to recover, but there's no doubt he's a special talent going forward. "He's the type of player a supporter loves, especially a Celtic supporter. "We need to develop him, we need to get him some games. If that changes then there's a number of options for him and teams that would like to take him, but at this moment he stays." Johnston made his debut in a 4-1 win over St Johnstone towards the end of the 2016-17 season, and signed a three year contract on the same day. Capped at under-19 and under-21 level for Scotland, Johnston is also eligible to play for the Republic of Ireland. His opportunities last season were limited through injury, but Rodgers remains a fan of Johnston, who has been at Celtic since the age of nine. "You get enough chance to show your qualities in training," said the Celtic manager. "He's been unfortunate that he was out for a long period with injury. But he looks strong, he's showed up well in pre-season, and its just the continuation of his development and what we feel is going to be best for him. His game quality really excites us." Ryan Christie, Scott Allan and Anthony Ralston were among 16 players sent out on loan from Celtic last season. 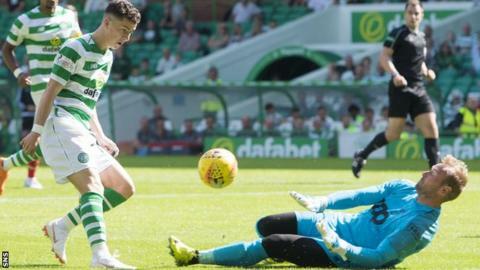 Jonny Hayes is yet to establish himself at Celtic and is still recovering from a broken leg, while Lewis Morgan has arrived from St Mirren with the hope of pushing for a starting place. Rodgers admits there is not a place for everyone, and says there are players fighting for their futures before the transfer window closes on 31 August. He said: "There's some players that clearly won't figure in the plans. I've spoken to a number of the people, all the players throughout pre-season, but there's certainly players here that are fighting to stay and want to be here. "It's really going to be whether they are satisfied with the number of games that they might get. We need a strong squad of players for the number of games we've got to play over the course of the season. By the end of the window it starts to level out what the squad is."